When you’re looking around for something to do, this spiral-bound book is bursting with ideas to keep your fingers busy and your brain entertained. 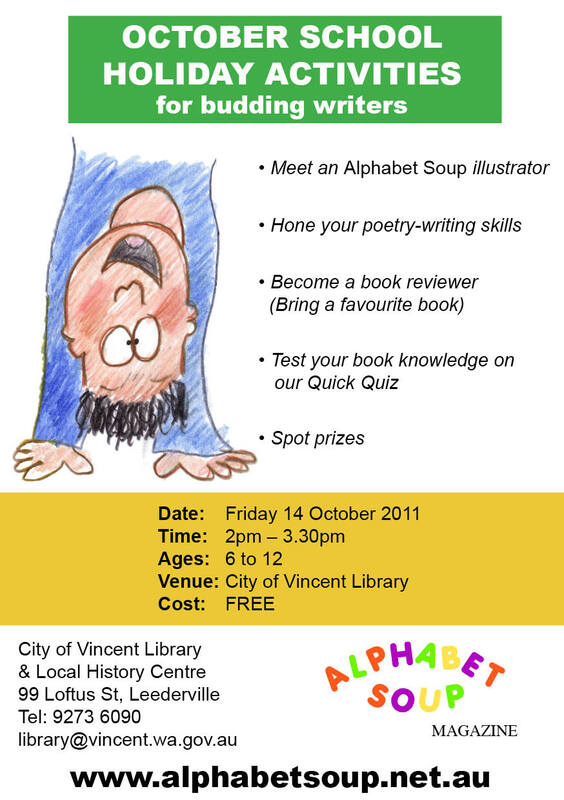 We recently had an email from a family wanting to know about creative writing classes/workshops for kids in Perth. WritingWA have published a list of classes on offer for Young Writers in Perth — the list includes classes running in term-time and in the school holidays. Visit the WritingWA site and check out the list for a class near you. If you can’t get to a class, you might like a website called Writing Classes for Kids that offers downloadable lessons. 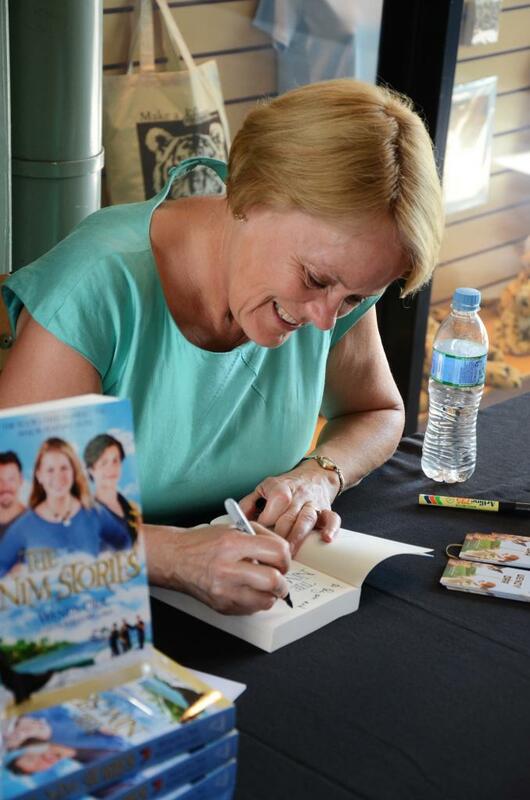 Wendy Orr signing copies of The Nim Stories. Photo by Ryan Makepeace. Nim’s Island and Nim at Sea are definitely in our pile of favourite books. (Nim’s Island was featured in our first ever issue of Alphabet Soup!) You probably know that Nim’s Island was made into a movie starring Abigail Breslin, and now the second Nim book has also been made into a movie called Return to Nim’s Island — and it’s out in Australian cinemas this school holidays. We asked the author Wendy Orr if we could talk to her about what it’s like to have your book made into a film. And here she is! When did you first hear that Nim at Sea would be made into a movie, too? Paula Mazur, the producer of the first Nim’s Island, wanted to do it as soon as she read the book when it was published in July 2007. However there were complications with the Hollywood studio and so three years ago she took it to an Australian company. They worked very hard to organise everything and in May 2012 we knew that it was going to be filmed. (Though I think everyone still had fingers crossed!) The filming started in August 2012. There is a different Nim (Bindi Irwin) cast in this second movie. Were you allowed to choose the actors? Did it feel strange to see a different Nim? It’s a lot like illustrators for the books I write — I’m not allowed to choose but if I suggest something the editor or producer is happy to think about it before making up their minds. They know a lot more than I do about the right illustrator or actor. I’ve been very lucky, with both illustrators and actors, and they’ve all felt very right for the parts. Of course, even though Abigail Breslin is a wonderful actor, by the time filming started [for the second Nim movie] she was 17, which is much too old to be Nim. But Bindi Irwin is absolutely perfect for the role — she loves animals and is used to handling them, and she’s incredibly strong and physically fit, just like Nim. That’s important to me, so I was delighted with the choice. It was also nice to hear that she’s always identified with Nim quite strongly and tells me the books have always been favourites. I thought it would feel strange to watch different actors, but in fact it all seemed completely natural. And because no actor could ever be completely identical to the character I imagined, it’s actually made it easier to go back to the characters in my head as I work on the third book. Do you ‘see’ the characters in your head while you write? For me, writing a book is a combination of watching a movie in my head, and feeling it in my body — not exactly as if I’m living it, but the way you feel the action in a dream. This movie had to make very big changes to the plot! The problem is that when I write a book, it doesn’t cost any more to print if my characters stow away on cruise ships than if they spend the whole book sitting in their bedrooms. But movies are different, and so the producer and directors have to decide how they can make a good movie, follow the story — and not spend more money than they have. So in this movie, Nim is very much the same character, just a bit older, and the feeling matches the book. Then they took two very important things from the plot: Nim making a human friend, and animal poachers threatening Selkie and other animals. But the story after that is quite different. As the book’s author, did you have a role to play in the making of the movie? I was a consultant, which means I read it at different stages and sometimes suggested some small changes. It was a bit like being an editor, which was a nice change for me. I also watched some of the filming, but that was just fun. I don’t know anything about filming, so the most useful thing I can do is stay out of the way. 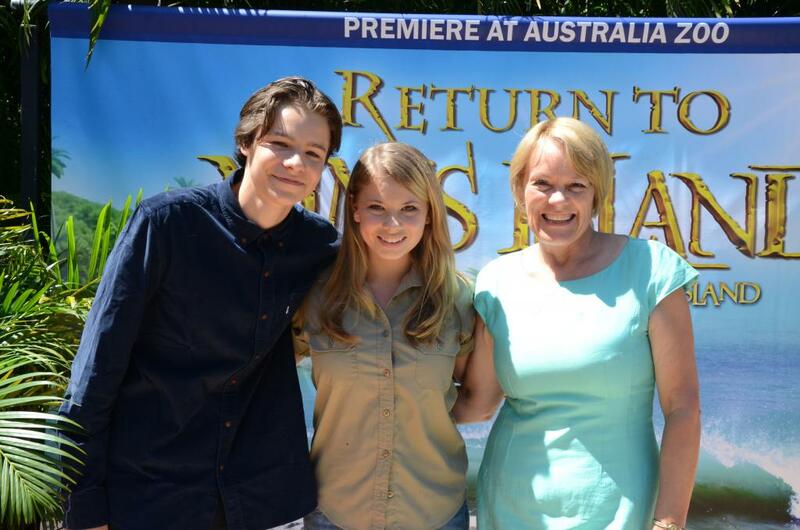 You attended the premiere of Return to Nim’s Island at Australia Zoo. What was it like to be watching the movie of your own book? The premiere of a movie is always incredibly exciting. It’s like getting the first copy of your new book, except with a huge party instead of a parcel in the mail. This one was exciting for all those reasons, but since I spent the whole day at the zoo first, with Bindi and Toby Wallace (Edmund), it was also really fun. I think these pictures will show why. 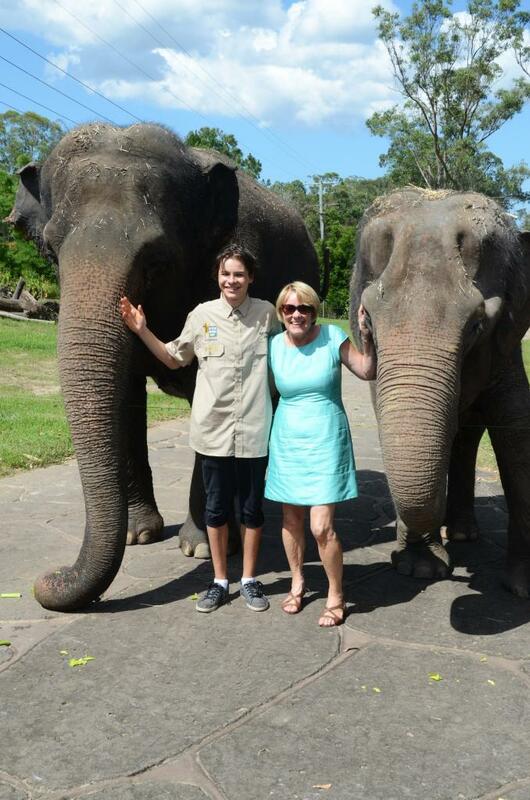 Wendy Orr with Toby and Bindi. Photo by Ryan Makepeace. 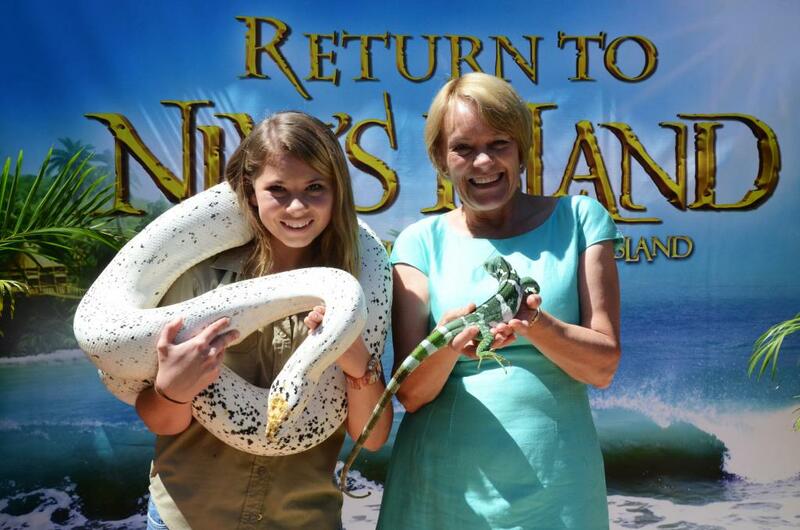 Wendy Orr with Bindi at the premiere of Return to Nim’s Island. Photo by Ryan Makepeace. At Australia Zoo for the movie’s premiere. Photo by Ryan Makepeace. Watching the movie of my own book is very strange, and quite emotional, especially the first time. It’s almost like looking at a family video, because it’s very familiar but different to actually see it on the screen. I thought it was good; I could see the audience enjoying it; sometimes I was afraid about what was happening next, even though I knew; sometimes I was amazed at the beautiful images — but mostly I just felt happy. Will there be more Nim books? Yes! My publisher would be very cross if I said no, because they have given me a contract for another Nim book, which I think will come out next year. It doesn’t have a proper title yet. At the top of this post we can see a photo of you signing copies of The Nim Stories. Is it a bindup of Nim’s Island and Nim at Sea or a different book again? Yes. It’s got the new cover but the two books are just the same, with the same illustrations. OK. I have to ask … Can the movie EVER be as good as the book? A movie can never be as good as the movie you make in your head when you love a book so much that you feel you’re inside the story — when you read about ice and feel cold even though it’s hot where you are, and when you see and hear the characters as if they’re alive. And for more about Wendy and her books (and Nim!) visit Wendy’s website and her blog. Happy holidays! 9am – 4pm both days, with a special 3pm performance featuring the newly created puppets on the second day! When: Tuesday 10 – Wednesday 11 April, or Monday 16 – Tuesday 17 April, or Thursday 19 – Friday 20 April. Spare Parts Puppet Theatre are running School of Puppetry Workshops in the WA school holidays (July 2011). Come to the Spare Parts Puppet Theatre to craft and perform your own puppetry show. Participants will also enjoy a performance of the current production as part of their workshop fee. Don’t forget your morning tea & lunch! When: 9am – 4pm both days, with a special 3pm performance featuring the newly created puppets on the second day!